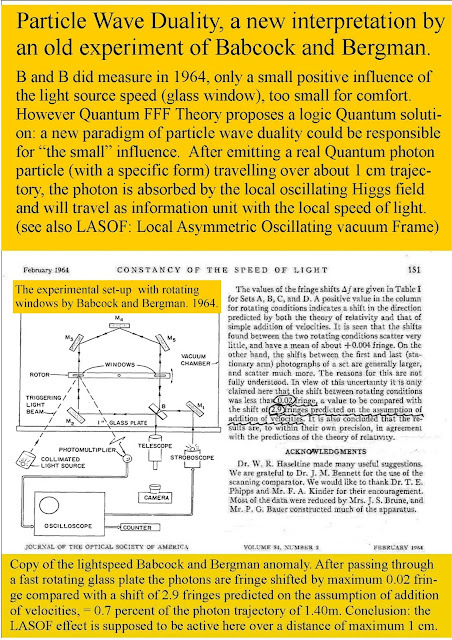 I would propose a dissident wave particle duality interpretation based on an old experiment of Babcock and Bergman (1964). 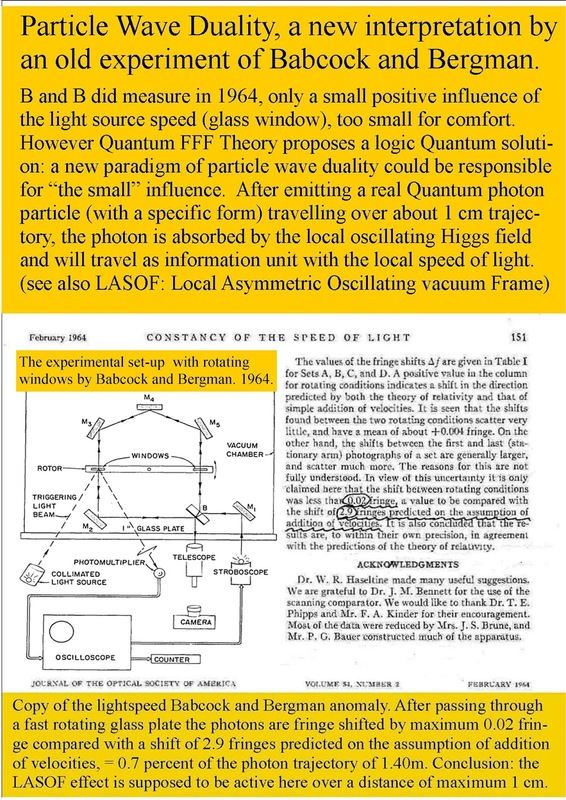 Babcock and Bergman did measure in 1964, only a small positive influence of the light source speed (glass window), which was too small for comfort there ideas about the direct relation between the light source and the lightspeed. The addition of the glass windows to the lightspeed was measured "only" 0.7percent over a trajectory of 1,45 meter! 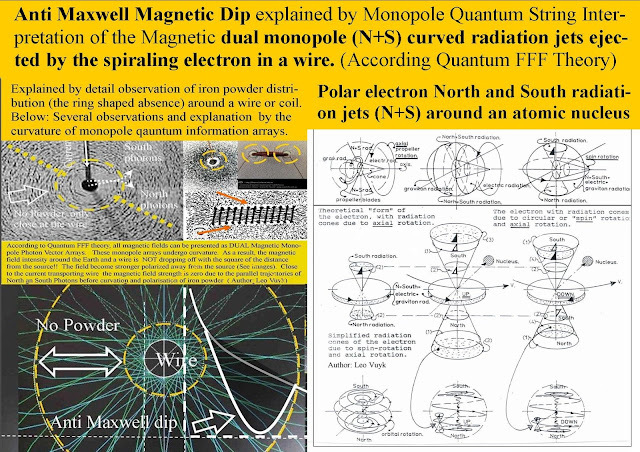 However I would propose a logic Quantum solution, if a new kind of particle wave duality could be responsible for “the small” effect. 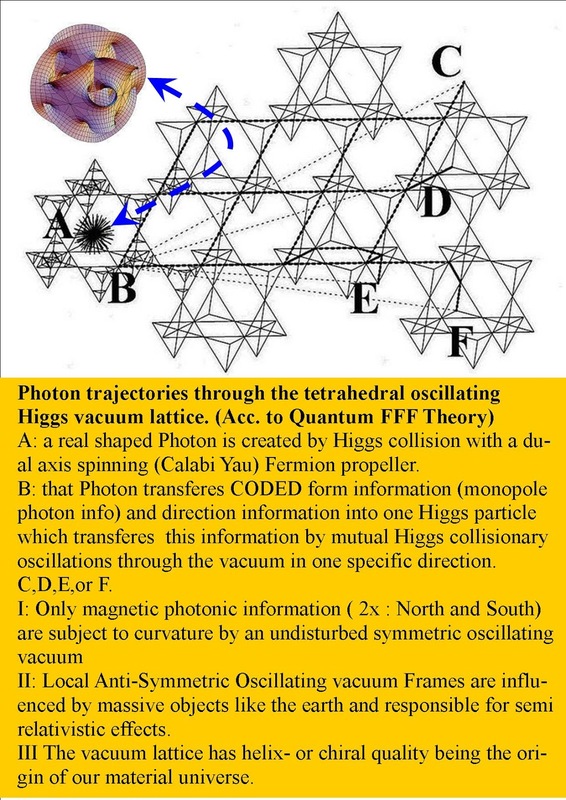 then the photon is supposed to be absorbed by the local oscillating Higgs field and will travel as information unit with the local speed of light ( of the Higgs field). 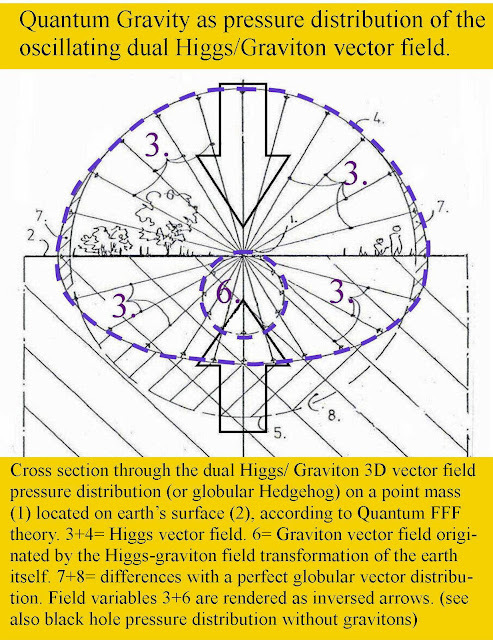 The Semi Relativistic Higgs Field Aether with mass related lightspeed adaptation. 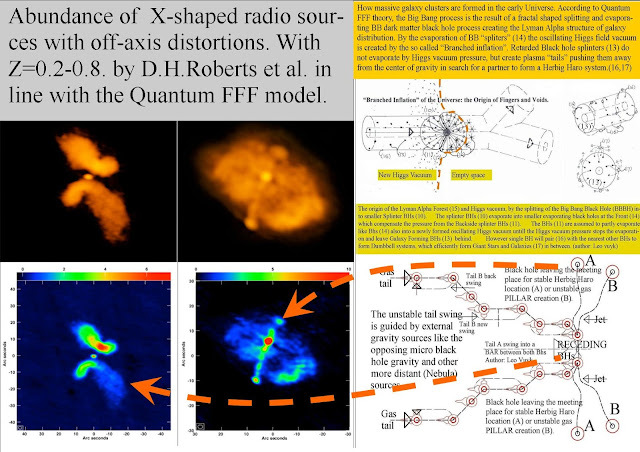 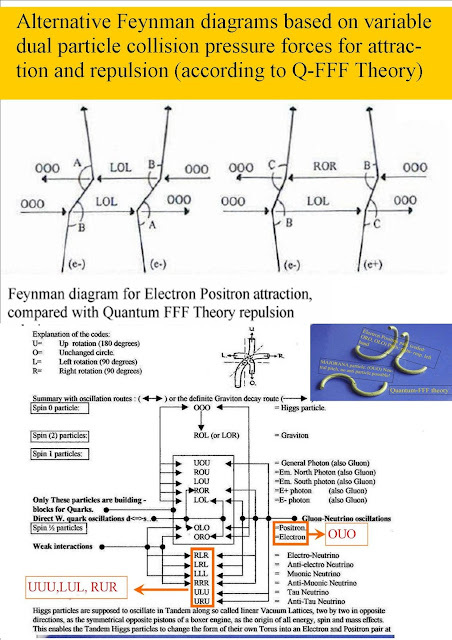 And: Quantum Gravity and Electro Magnetic Forces by Dual Repulsive Vacuum Oscillation Spectra in FFF-Theory. Image: Photon trajectories through the tetrahedral oscillating Higgs vacuum lattice. 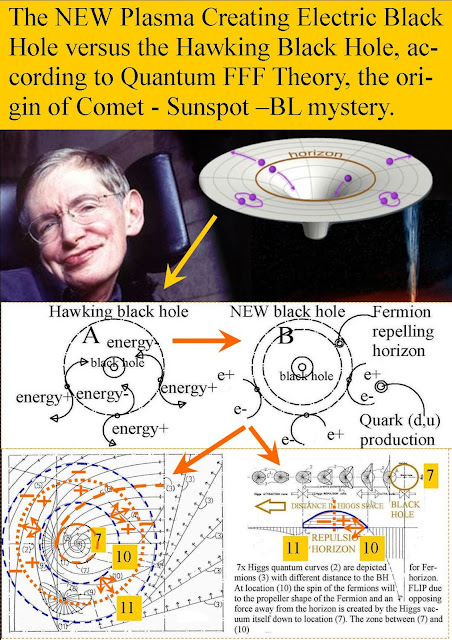 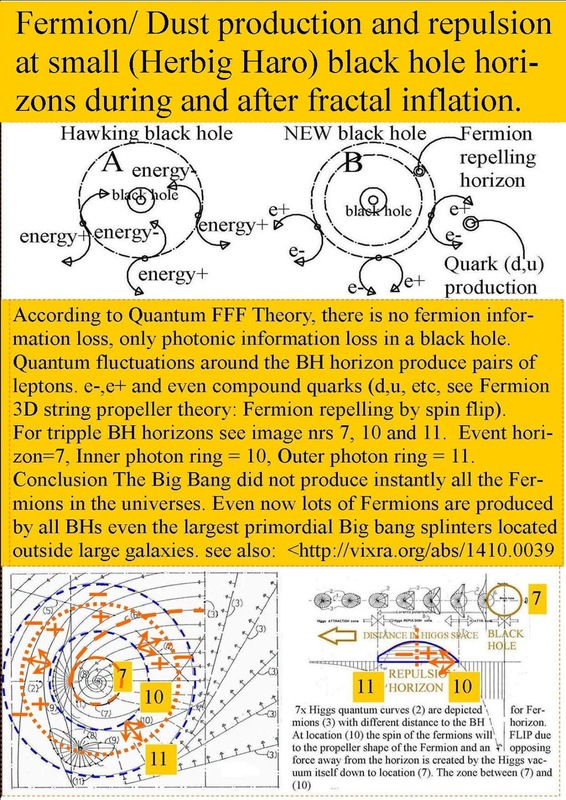 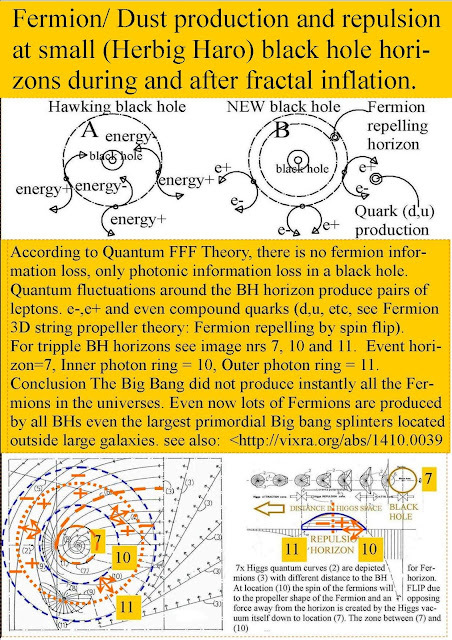 A: a real shaped Photon is created by Higgs transformation due to collision with a dual axis spinning Fermion propeller. 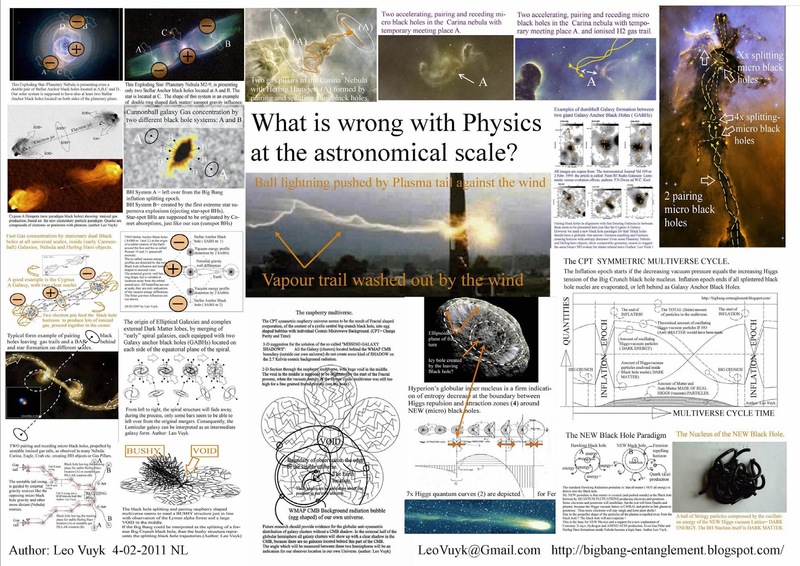 Fermion propellers all describe a "Calabi Yau" profile driven by Higgs vacuum oscillations. 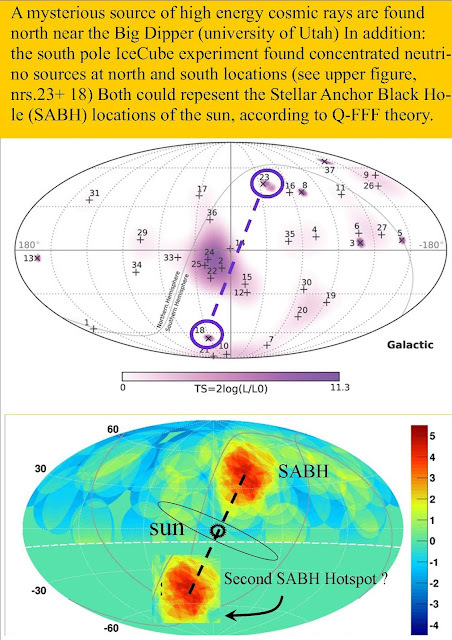 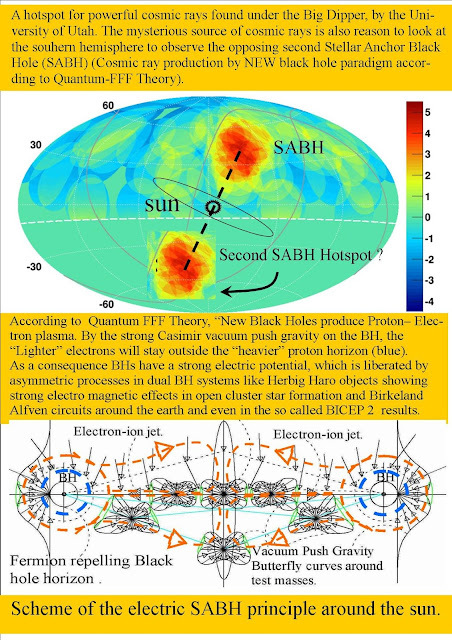 II: Local Anti-Symmetric Oscillating vacuum Frames are influenced by massive objects like the earth and responsible for semi relativistic effects. 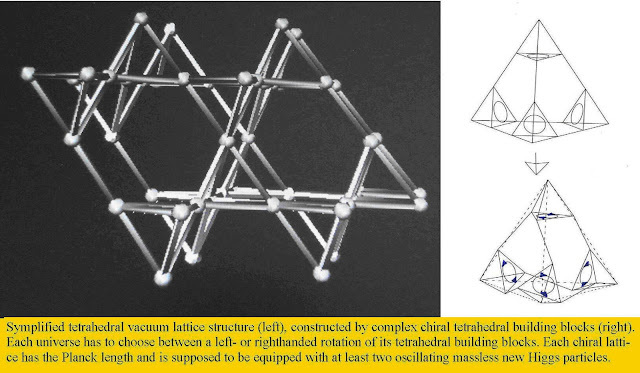 III The vacuum lattice should have helix- or chiral quality being the origin of our material universe. 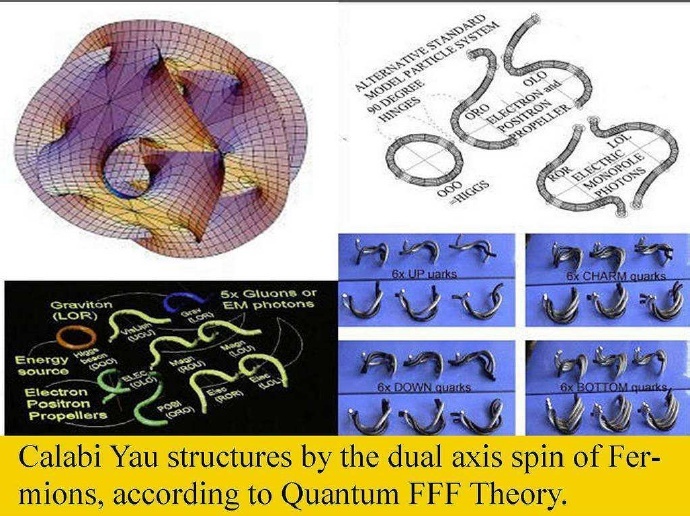 Attraction forces seem to be done by dual pressure forces. No loops needed. 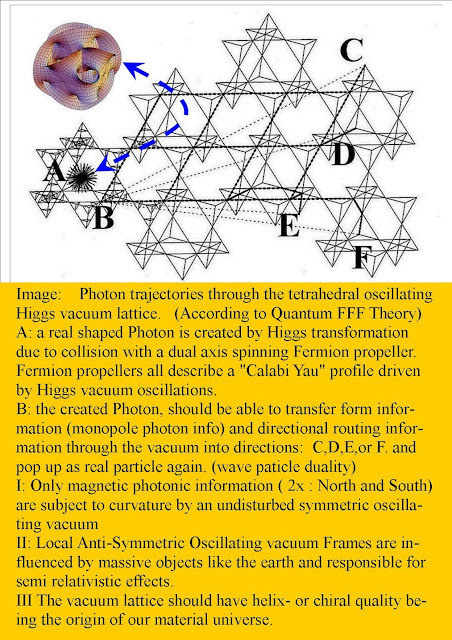 The Chirality of the vacuum lattice of the oscillating Higgs field. 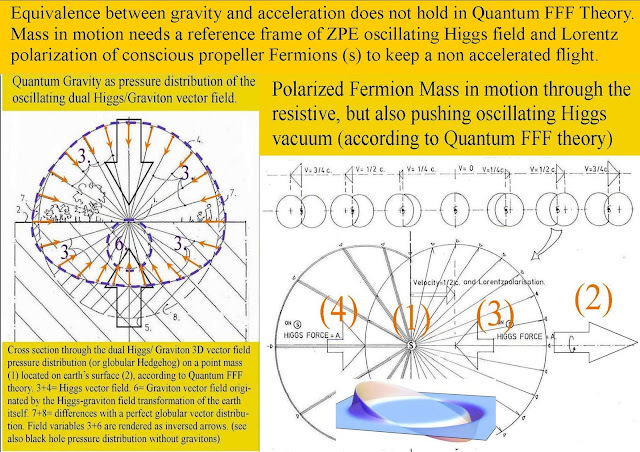 Dual pressure Gravity between Higgs and Graviton pressure and the origin of Lorentz polarization by mass in motion. 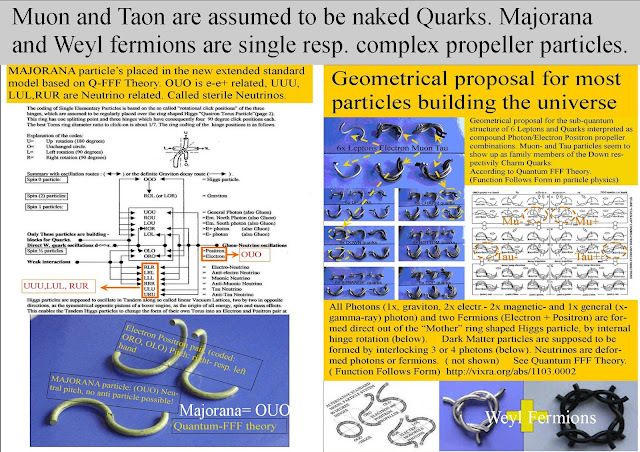 and second: elementary particles should be "guided by a pilot wave". if we combine the ideas of Vigier, Bell, Bohm and Salam, and a new dual universal Bohmian "pilot wave", which is interpreted as the EPR correlation (or Big Bang entanglement) between individual elementary anti-mirror particles, living in dual universes. 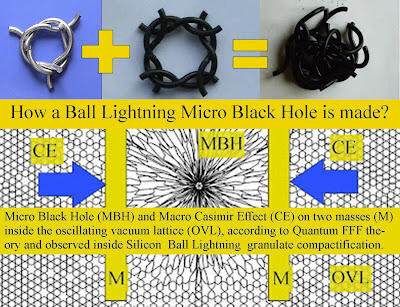 So my Quantum FFF model is also based on a Rigid String Theory with real rigid transformable strings able to mutate and merge by form based interlocking. 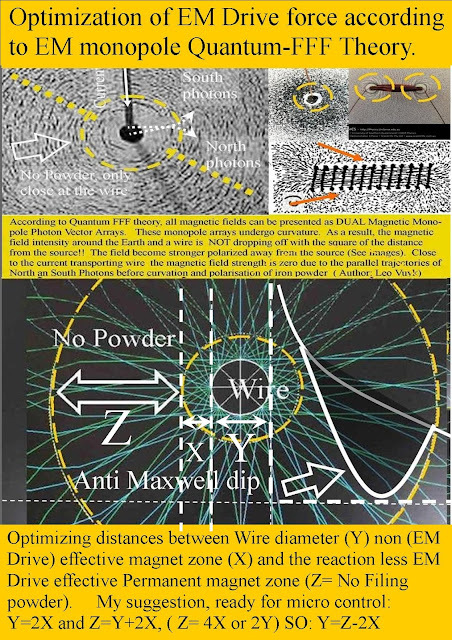 the Maxwell field is not continuous! 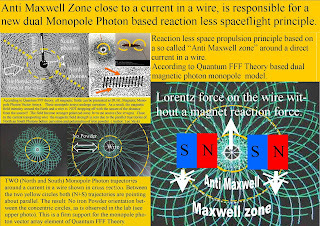 and reason for reaction less space flight or magnetic space flight..
Anti Maxwell Lorentz force effect around a direct current in a wire for reactionless drive. 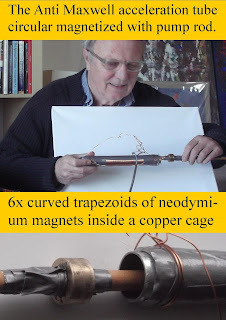 Reaction less space propulsion experiment . Function Follows Form in Quantum FFF Theory. The rigid FORM and Microstructure of elementary particles (strings) , is supposed to be the origin of FUNCTIONAL differences between Higgs- Graviton- Photon- and Fermion particles. 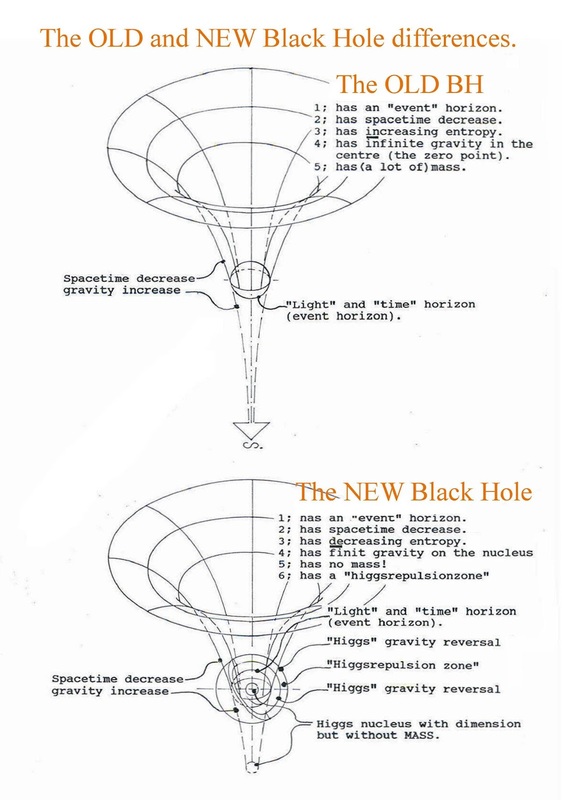 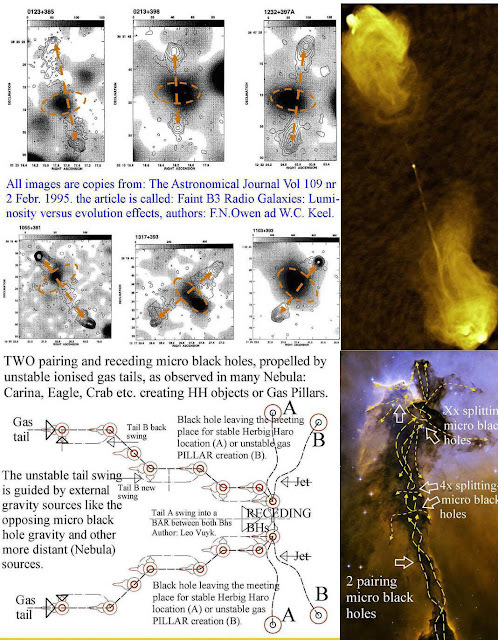 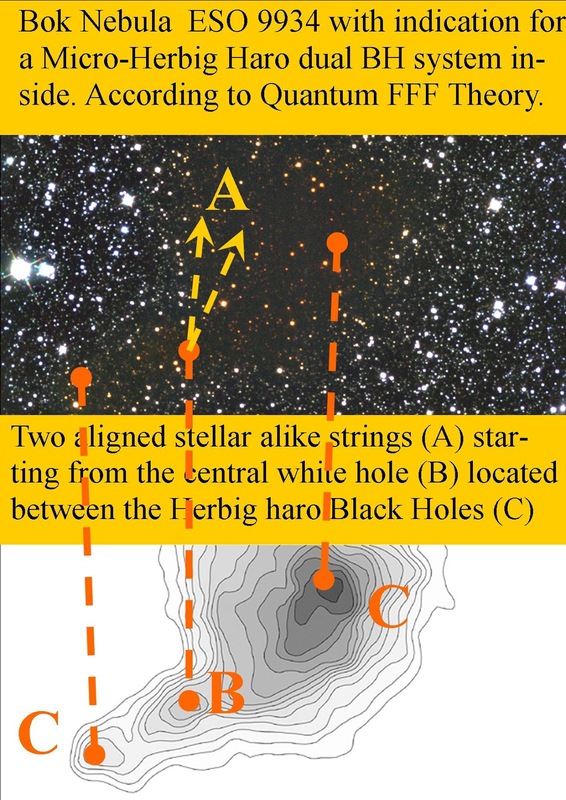 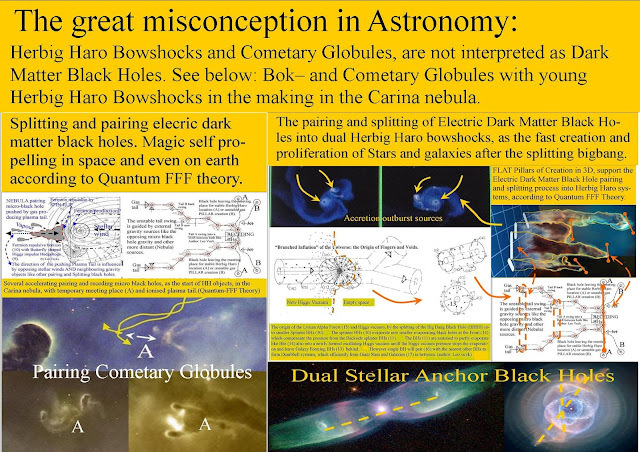 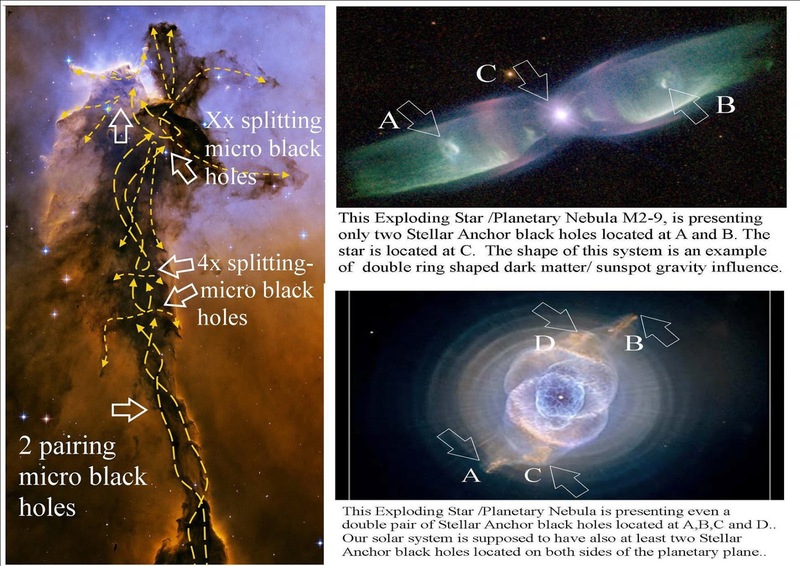 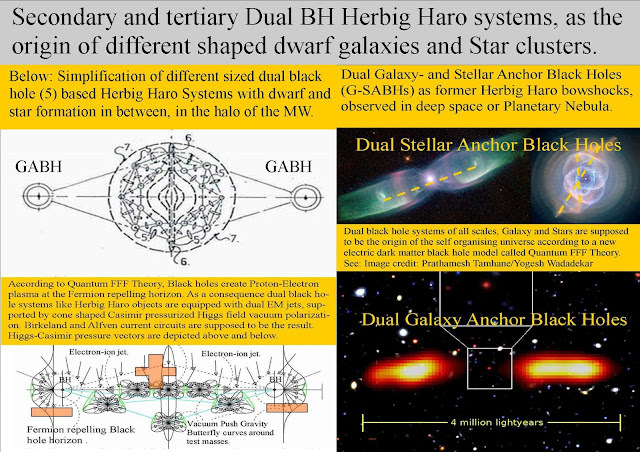 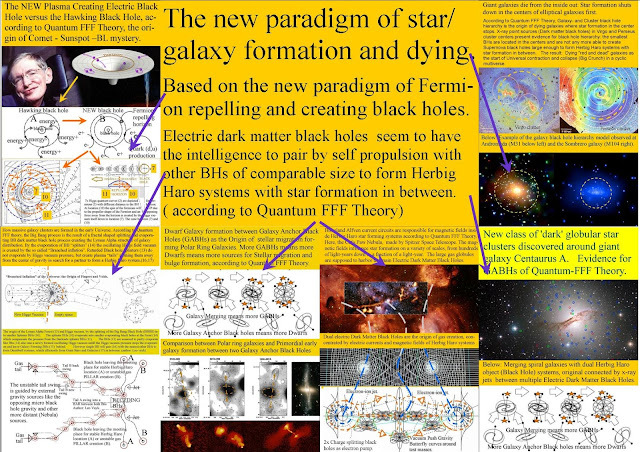 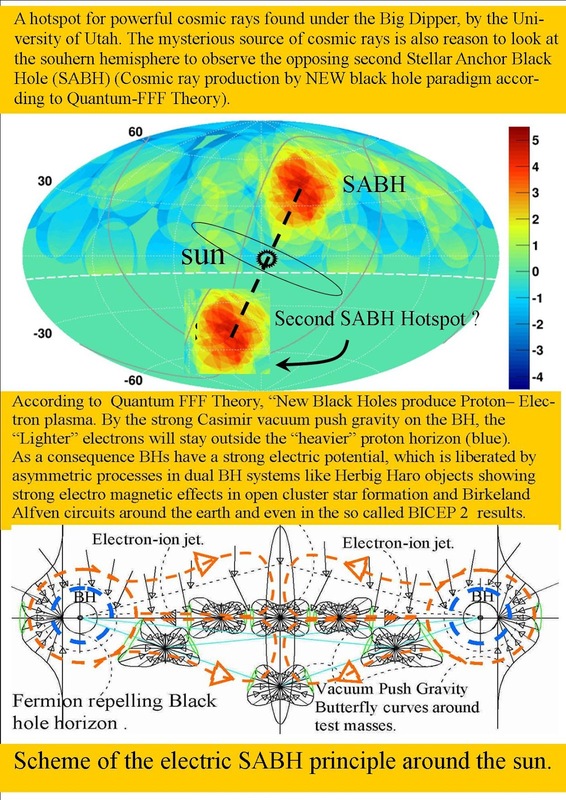 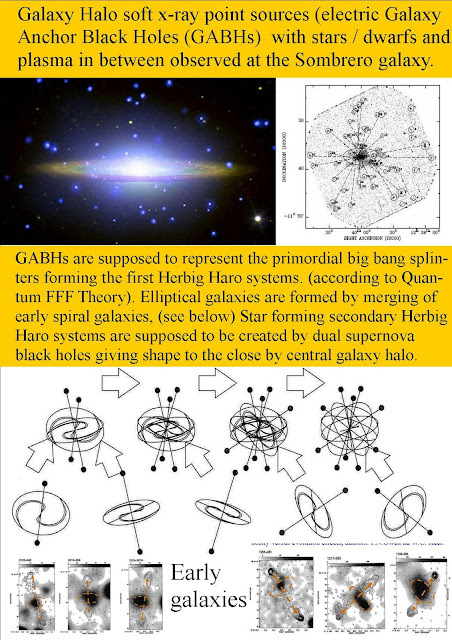 As a consequence, a NEW splitting, accelerating and pairing new paradigm Black Holes, seem to be able to convert vacuum energy (ZPE) into real energy and even matter and explain quick Galaxy- and Star formation, by so called Stellar Anchor Black Holes (SABHs), Herbig Haro Hotspots ( Bowshocks), down to Sunspots, Comets and even Ball Lightning. 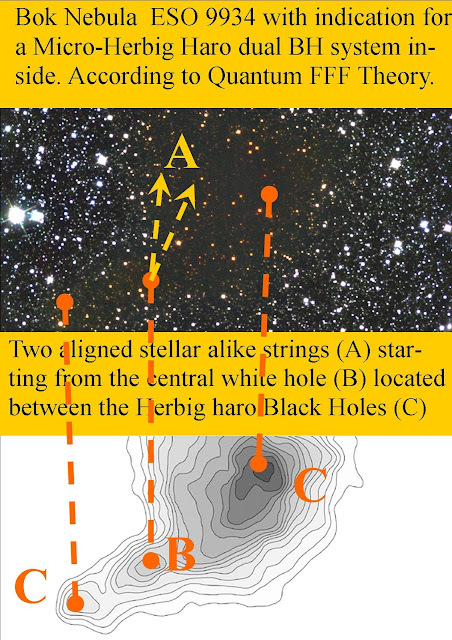 At the same time, it is observed that the angular momentum vectors of bipolar planetary nebula are not random distributed in the Milky Way. See below: micro bowshocks in the Carina nebula. Many of the butterfly (bipolar) nebula have their long axes aligned along the plane of our galaxy.
" Alignment of the Angular Momentum Vectors of Planetary Nebulae in the Galactic Bulge" by B.Rees and A.A.Zijlstra. 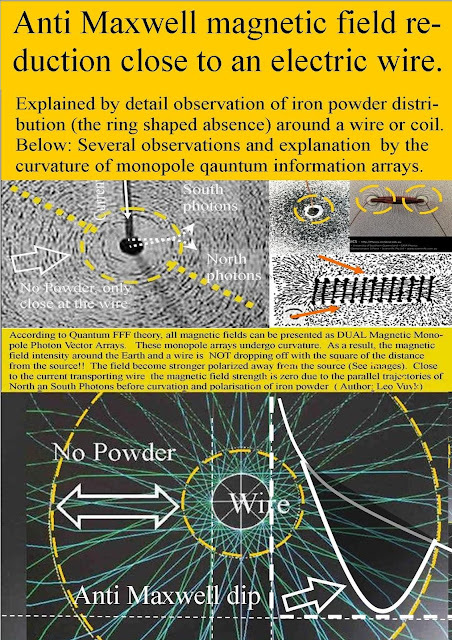 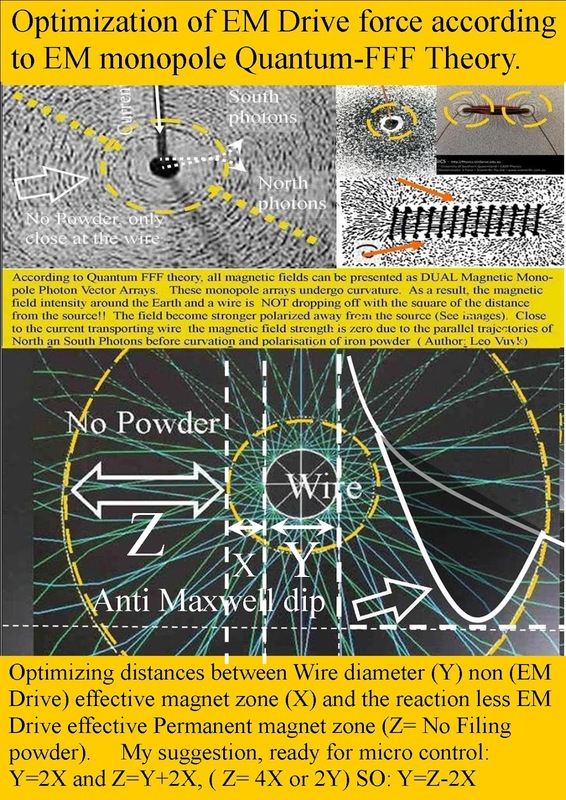 Anti-Maxwell reduction (dip) effect originated by local parallel oriented Dual Electron Magnetic Monopole Radiation Cones (or South+North monopole jets) in spiral motion at the surface of a direct current in a wire. Anti Maxwell Magnetic Dip explained by Monopole Quantum String Interpretation. 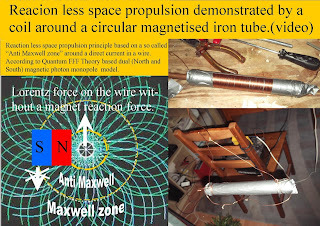 TEST of Anti-Maxwell Lorentz propulsion effect, with simple coiled circular magnetized steel tube . 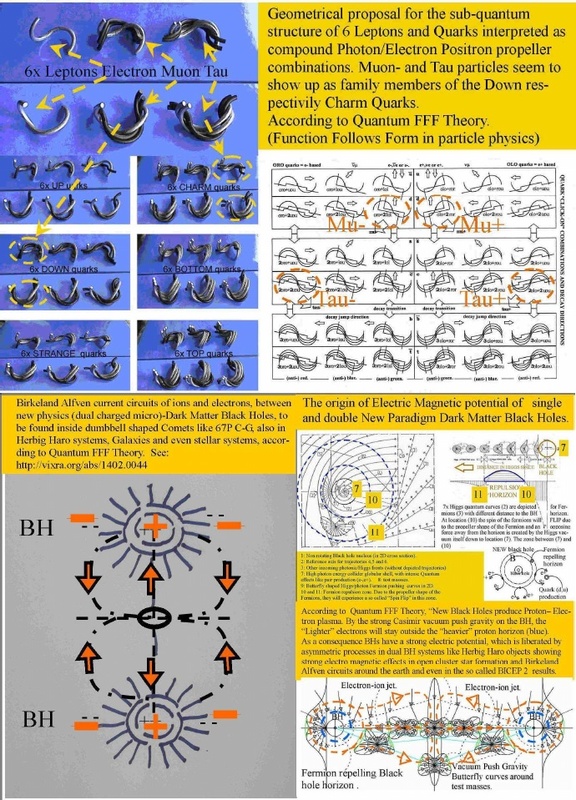 Conclusion: this is a first experimental support for a dual monopole magnetic photon model based on Quantum-FFF Theory. 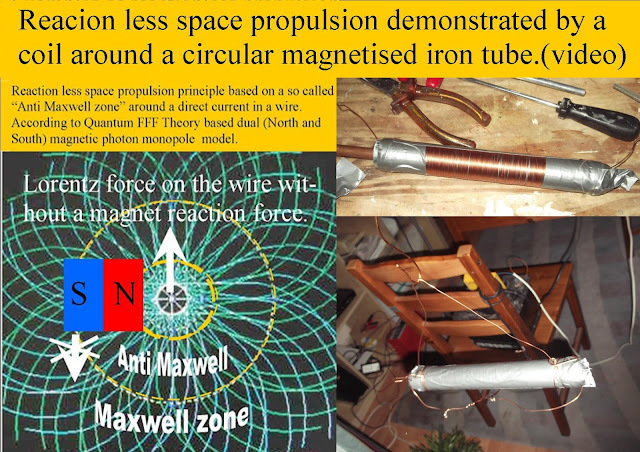 The Anti Maxwell acceleration tube circular magnetized with pump rod. 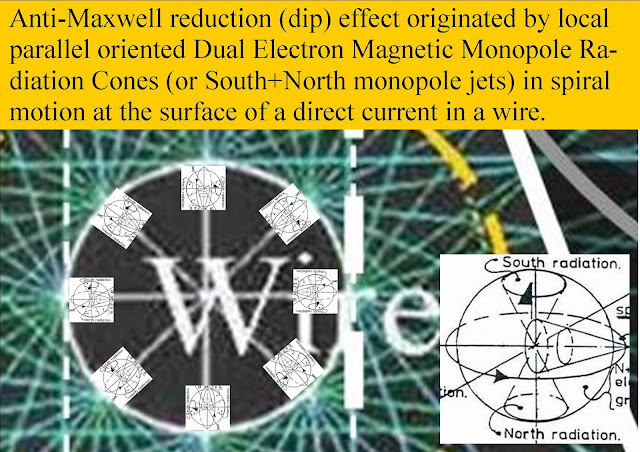 Direct proof for the effect, the acceleration is direction indipendent also up and down. Now the vertical variant, up or down acceleration by the Anti Maxwell effect. Quantum FFF Theory Essentials Beyond Einstein,Maxwell and Newton´s 3e law. 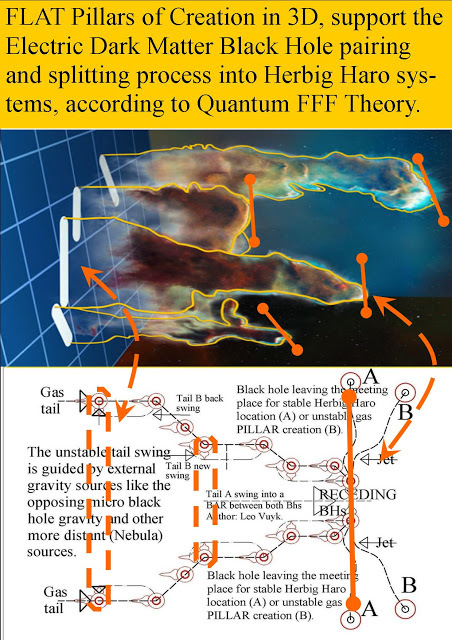 Quantum FFF Theory Essentials Beyond Einstein. 3: God plays indeed dice! Higgs particles represented as rigid torus shaped strings are supposed to be able to mutate by internal hinge rotations into a variety of single electron, positron, gluon, photon, neutrino shapes able to combine into compound quarks by an interlocking merging system. 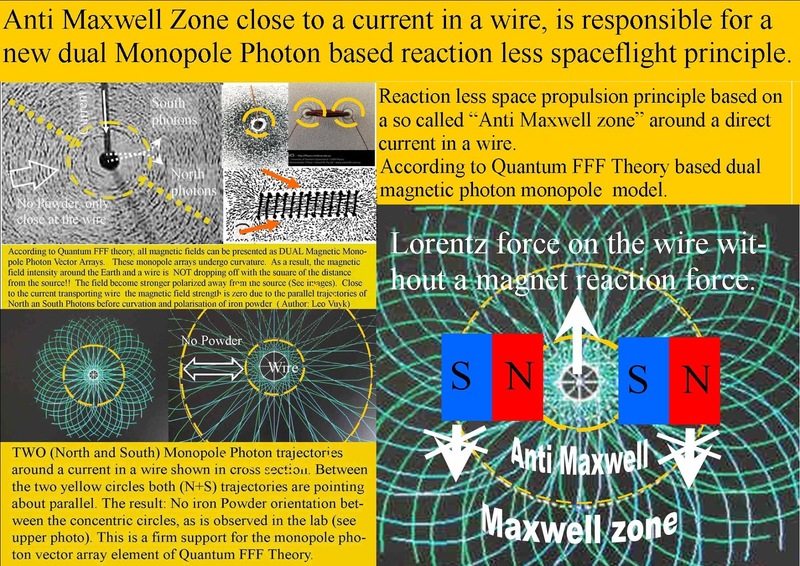 See also: Anti Maxwell Lorentz force effect on a direct current in a wire as reactionless drive. 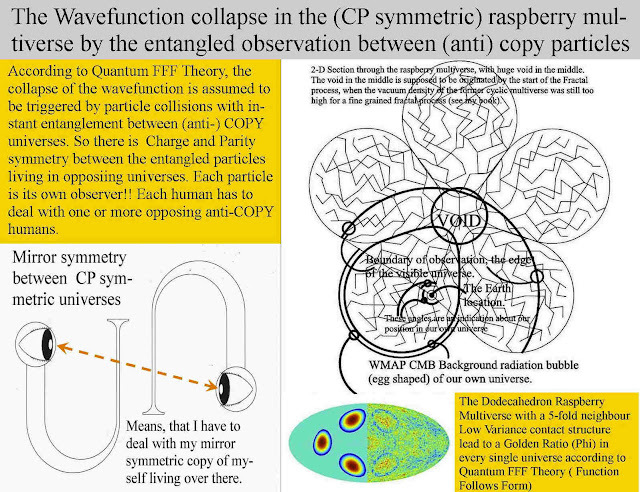 ER=EPR in the multiverse and in the lab. 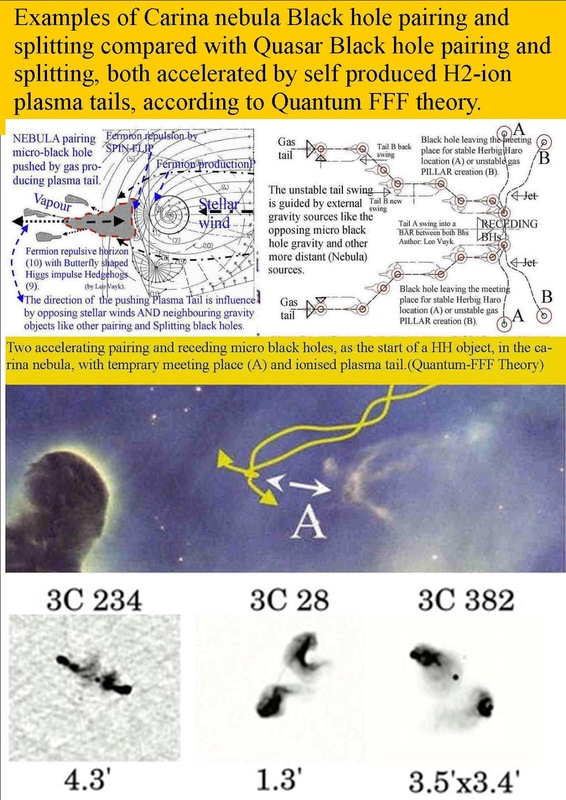 IMHO, Einstein Rosen (ER) wormholes between copy entangled particles are the guiding channels .for Einstein Podolski and Rosen (EPR) non local entanglement even at universal distances. see also: ER=EPR in the Supersymmetric Cyclic Multiverse and in the lab without strange Cats. see also: The Raspberry Shaped Super Symmetric Multiverse Without a Cat Paradox. 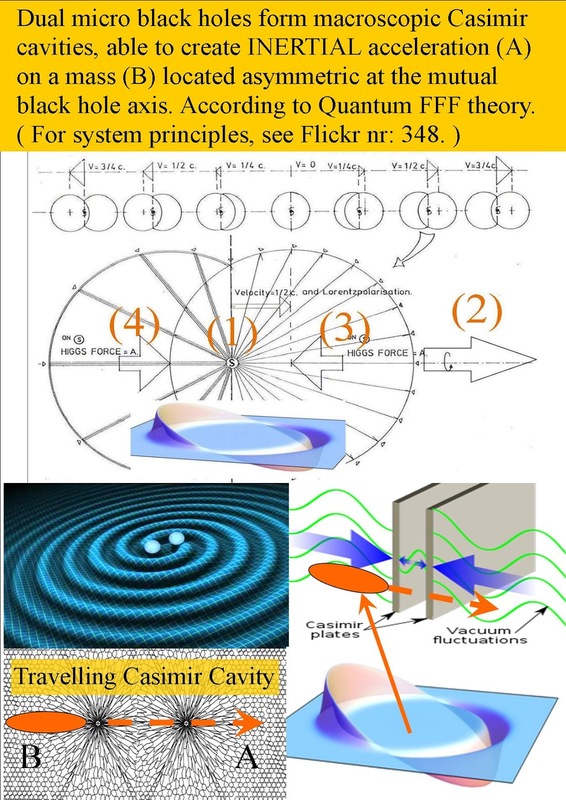 Casimir -Graviton Quantum Gravity by dual opposing pressure fields. Dual Casimir-Graviton quantum pressure gravity of Quantum FFF Theory could be described as a kind of dual "Macro Casimir effect" inside a dual gravity theory. 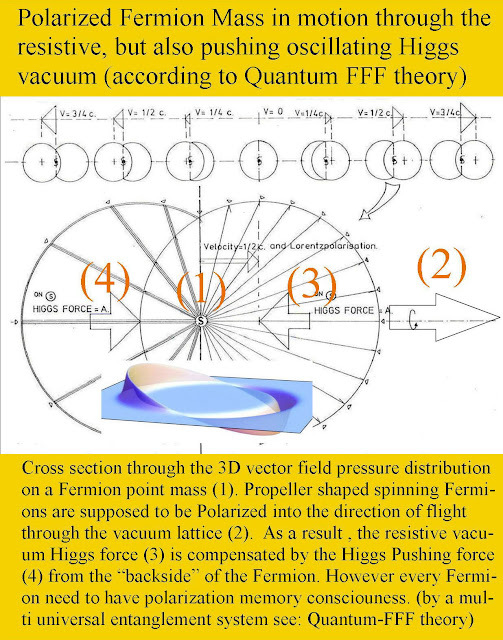 It is assumed that the microscopic Casimir effect is caused by the oscillating Higgs vacuum field pressure on mass carrying particles. 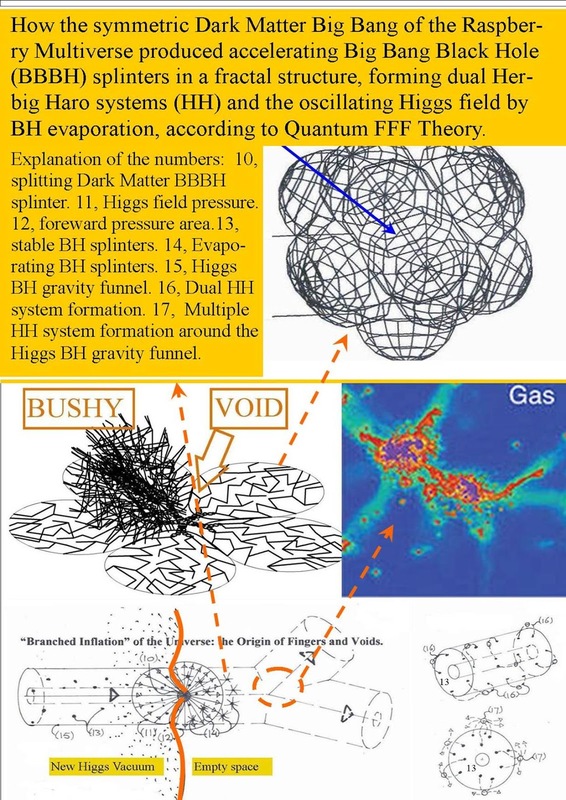 It is also assumed that the total Higgs/Casimir pressure from outside acting on a mass like the earth, is larger than the Higgs pressure coming out from the inside of that mass. Inside the earth, many Higgs field particles are assumed to change by collision with Fermions into pressure Gravitons. 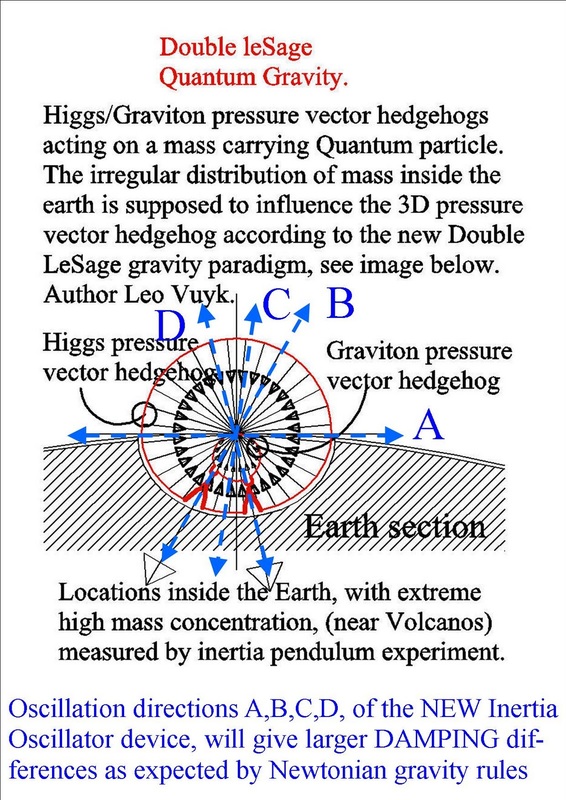 Pressure Gravitons are supposed to have less pressure capacity than each Higgs particle, as a result gravity seems to exert a pull effect. .
Gravitons are supposed to be not able to change by collision into other particles,as a consequence the Higgs vacuum pressure is diluting during the life time of the universe.